There’s no denying how fun bath bombs are. As soon as they hit the water they start fizzing, moving around the tub, and releasing color. But have you ever used a bubbling bath truffle? The experience is a bit different but just as fun. As you break them up under the running faucet, they slowly produce creamy, fluffy bubbles. It’s a luxurious experience unlike any other. 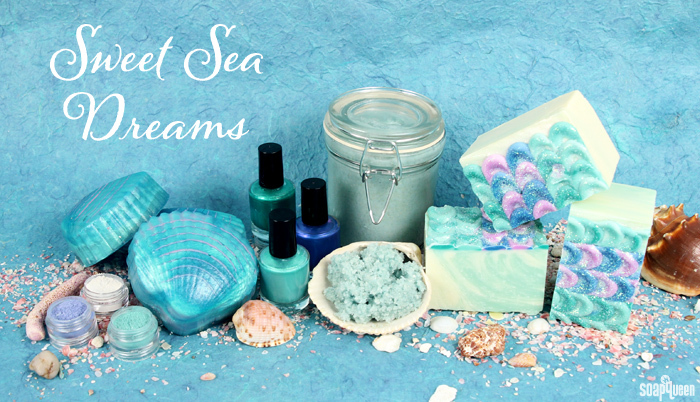 If you’re ready for some bubbly goodness, give these DIY Mermaid Bubbling Bath Truffles a try. They have all the components of a great truffle – SLSA for bubbles, shea and cocoa butter to moisturize, and cream of tartar for the signature fluffy texture. 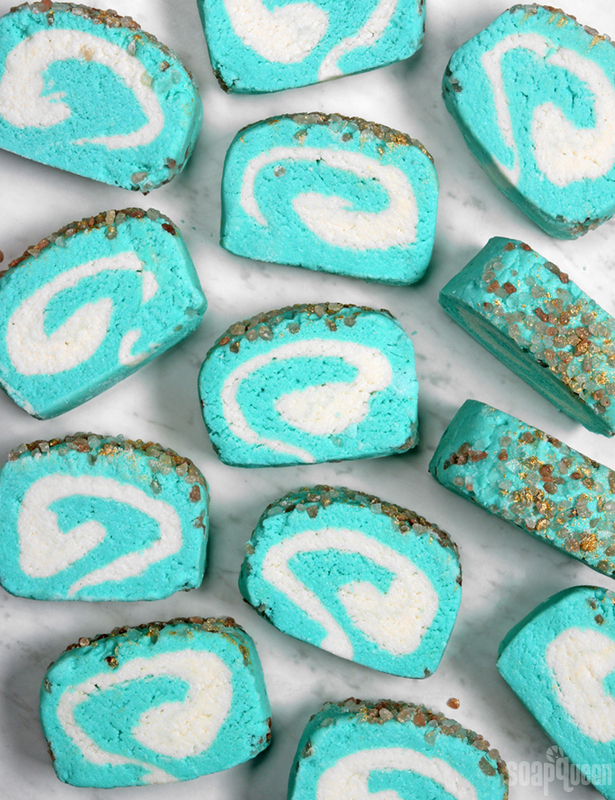 These bars also have sea-inspired additives like coarse pink sea salt and Aqua Pearl Mica. 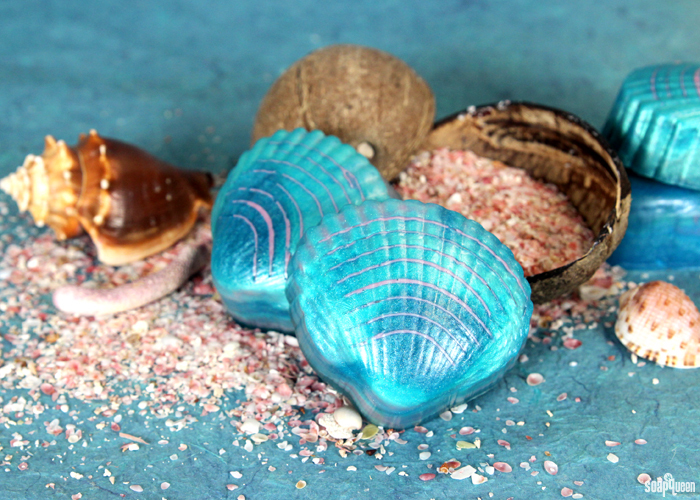 Finish them off with Island Escape Fragrance Oil and it will feel like you’re at the beach every time you use a bar. Here in the Pacific Northwest, we have been experiencing a heat wave with temperatures in the high 80’s. While it’s not officially summer yet, it certainly feels like it. It has inspired me to create projects with bright colors, fruity scents and skin-soothing properties. If you’re looking for some summer DIY inspiration, I’ve rounded up some of my favorite projects below. 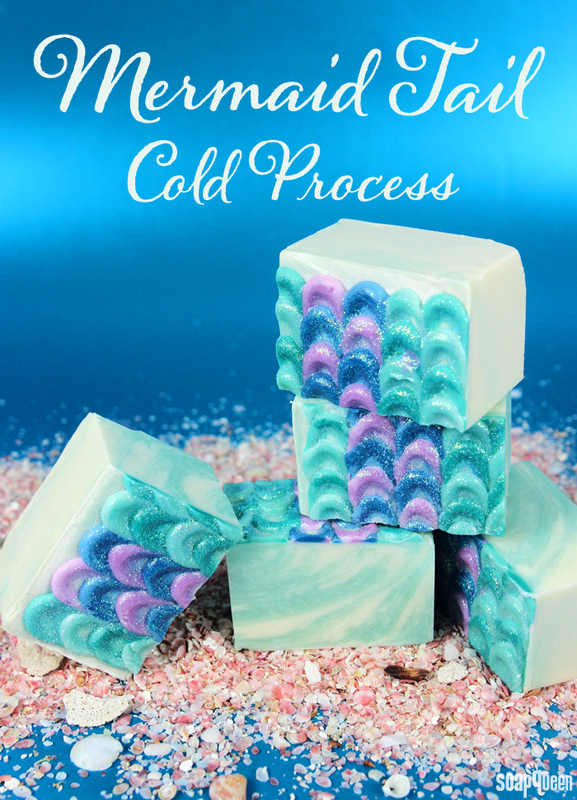 Now is the ideal time to create cold process soap for July and August. 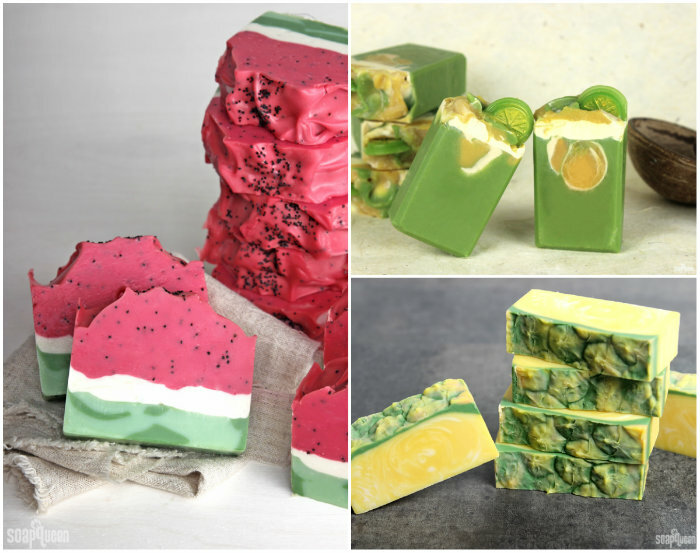 If you’re looking for some fruity options, the Juicy Watermelon Soap Tutorial shows you how to create soap that looks and smells just like watermelon. The Lime in the Coconut Milk Cold Process combines Lime Essential Oil with Coconut Lemongrass Fragrance Oil to create a tropical scent. It’s also made with coconut milk powder to give the skin extra moisture. Love pineapple? The Perfect Pineapple Soap Tutorial shows you how to create soap with a realistic fruit texture. 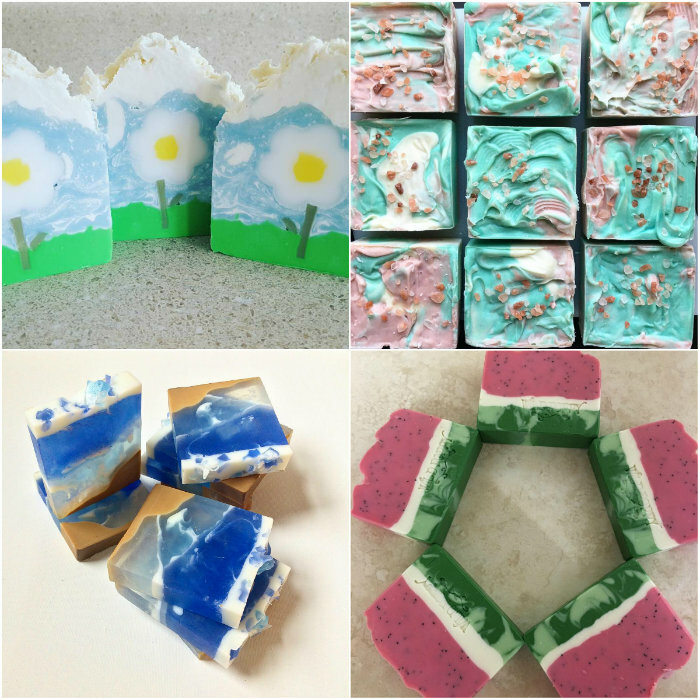 If you prefer floral scents, the Sunflower Cold Process Soap Tutorial creates sunny and cheery bars. The Clover and Aloe Spin Swirl Cold Process Tutorial shows you how to create soap with the spin swirl technique. It’s created with Clover and Aloe Fragrance Oil, which features notes of green tea, lily, mint and citrus. 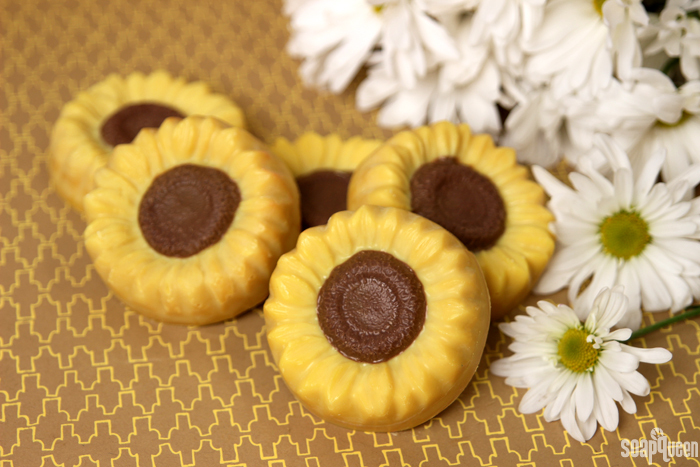 The Sunflower Cold Process Soap Tutorial shows you how to make these adorable bars. Can’t make it to the beach? 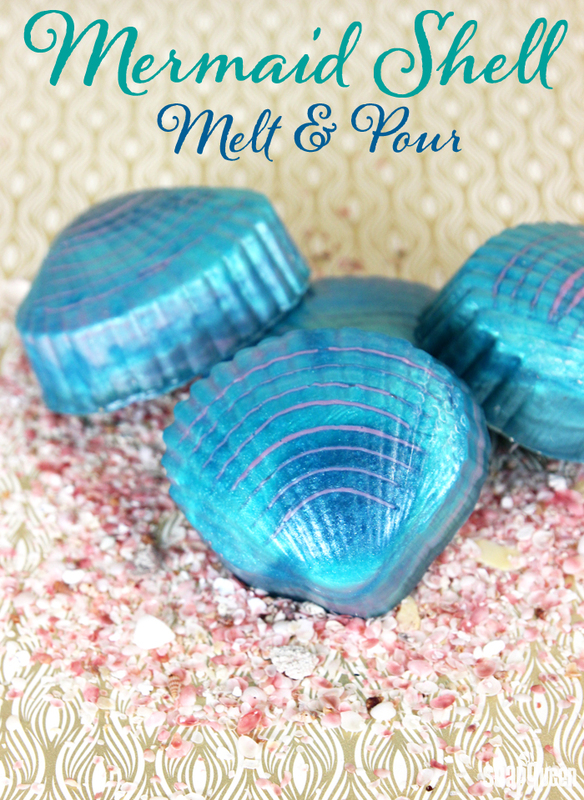 The Mermaid Shell Melt & Pour Soap will have you feeling like an mermaid with every shower. 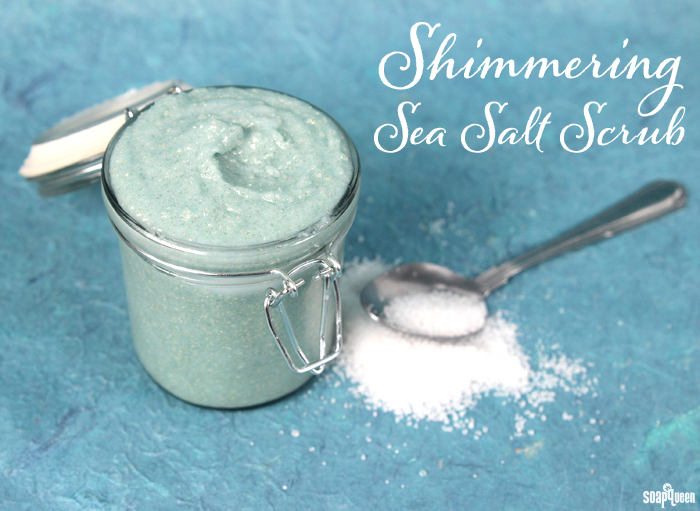 The Shimmering Sea Salt Scrub is made with coconut oil, shea butter and fine grained Dead Sea salt. It’s great for prepping legs for shaving. Just make sure to use it before shaving, because salt can sting a little on newly shaved skin. 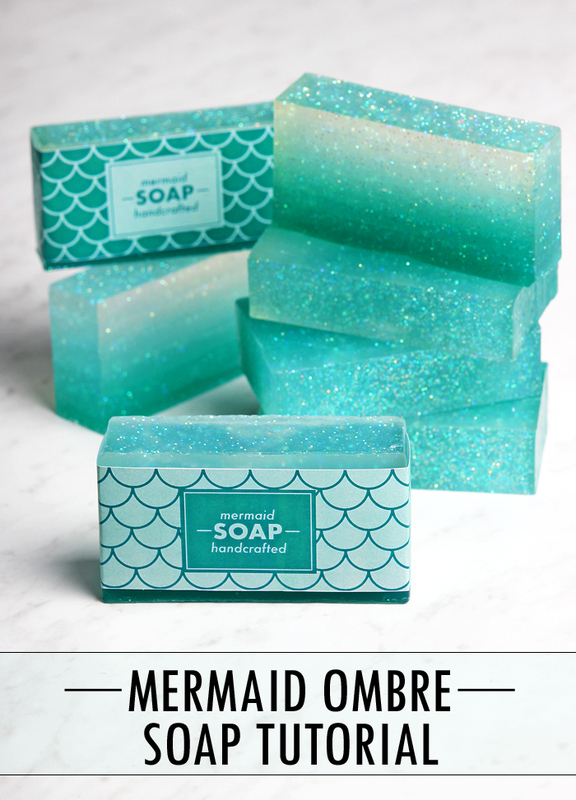 Last but certainly not least is the Mermaid Tail Cold Process Soap, which is created by squeezing small dots of soap and smoothing them out with a spoon. 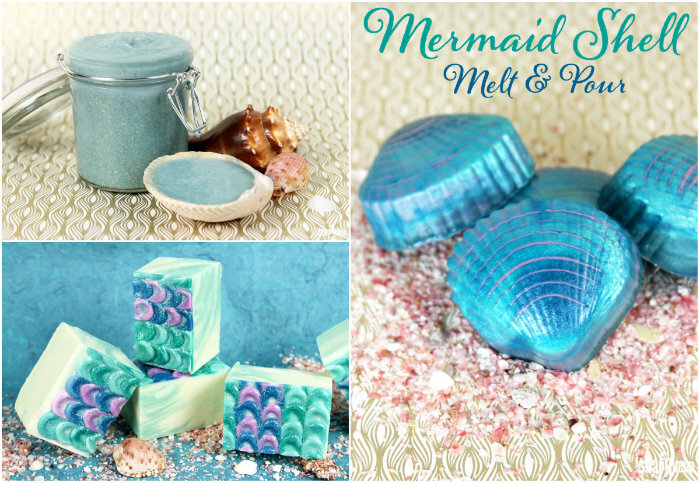 Speaking of mermaids, this Mermaid Ombre Soap Tutorial on the Handmade Beauty Blog is full of sparkle. 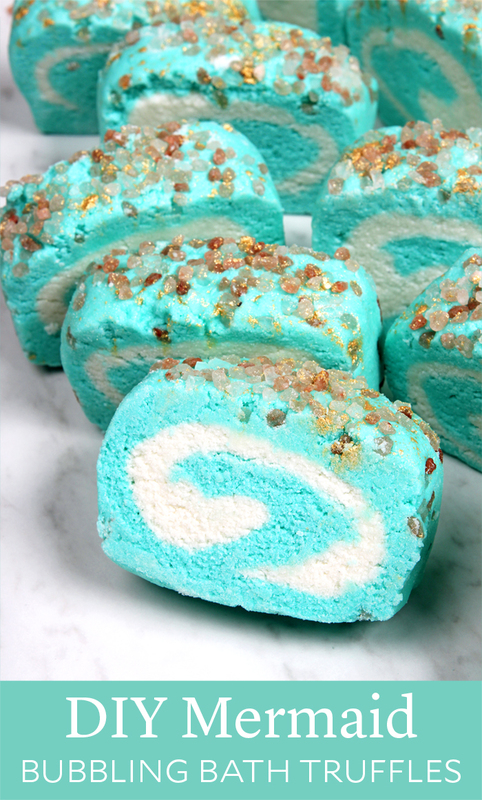 It’s scented with Relaxing Fragrance Oil, which features notes of lavender, jasmine and vanilla. 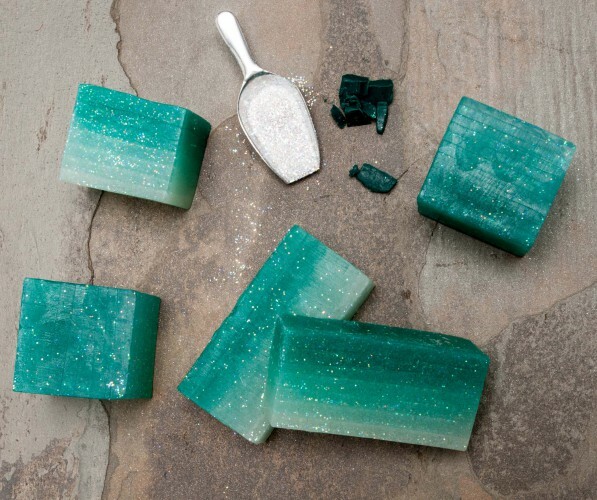 To prevent the fragrance from discoloring the gorgeous aqua hue, the soap is made with Stephenson Vanilla Stable Melt and Pour Base. 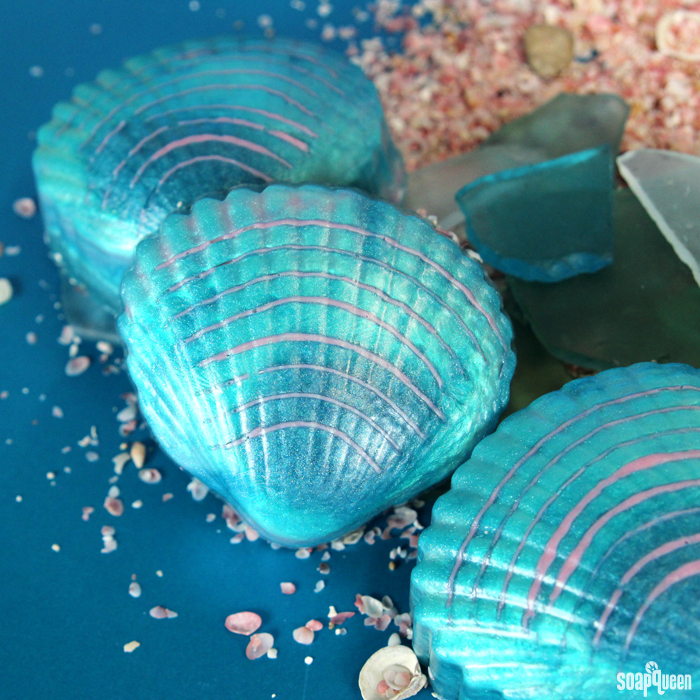 Learn how to create these Mermaid Ombre Soaps on the Handmade Beauty Blog. If you don’t have a summer glow yet, fake it with homemade bronzer. 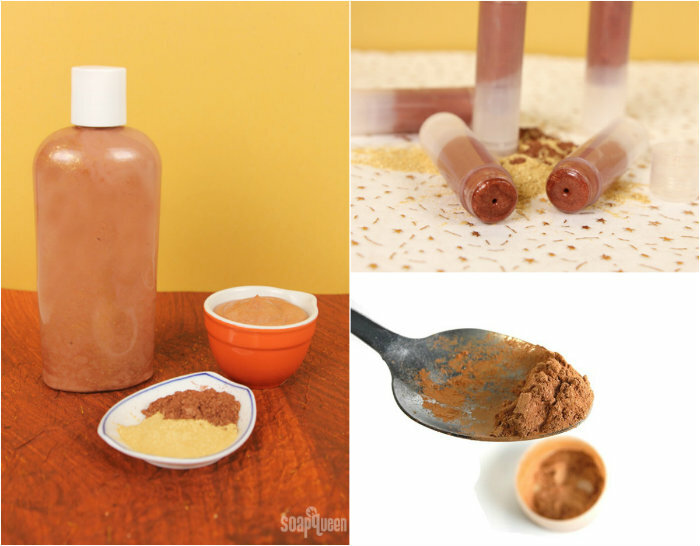 The Bronzing Lotion Recipe is easy to make and customize to your skin tone. If you prefer a powder, making your own powder bronzer is easier than you think; click here to see the tutorial. The Beautiful Bronze Lip Tint Tutorial shows you how to add a golden shade to your lips. 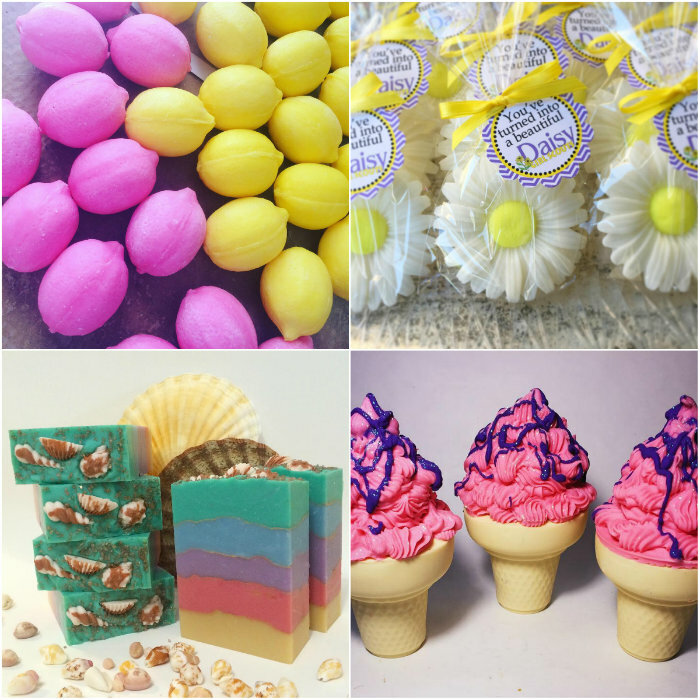 I love to get inspiration from the #SoapShare hashtag on Instagram. 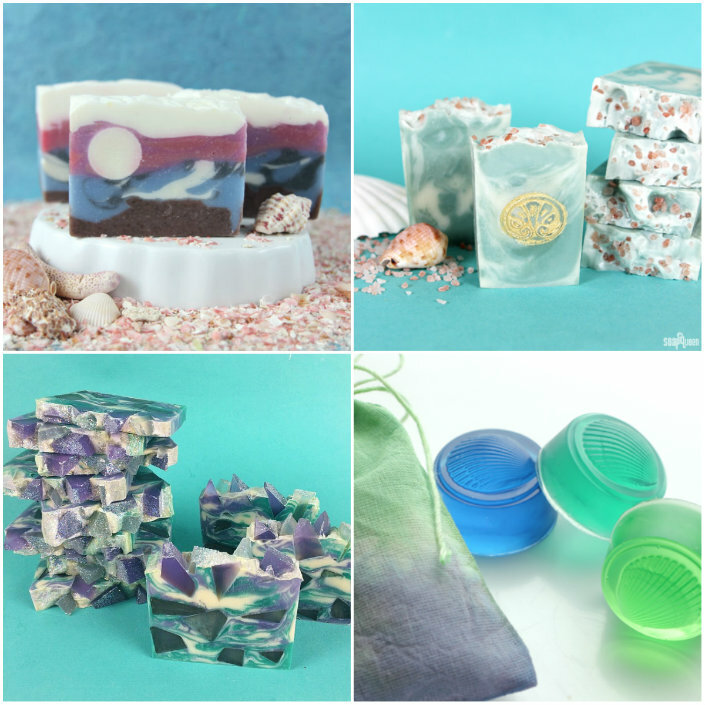 The soaping community is creative and talented! Check out some of my favorite summer projects via Instagram below. 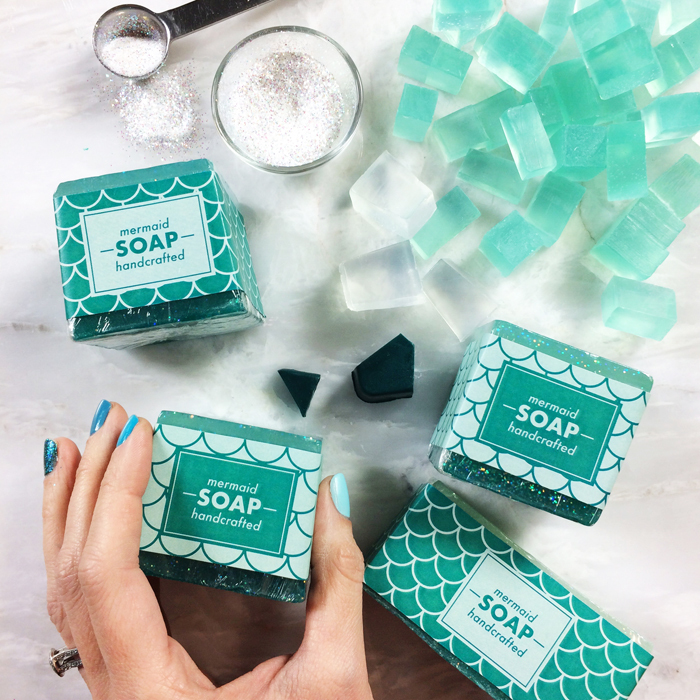 Keep tagging your photos with #SoapShare, I love to see what you’re making! What type of projects are you making this summer? I have been working on some facial sprays to hydrate skin on the go. Look out for those soon! Mysterious and beautiful, mermaids are universally appealing. 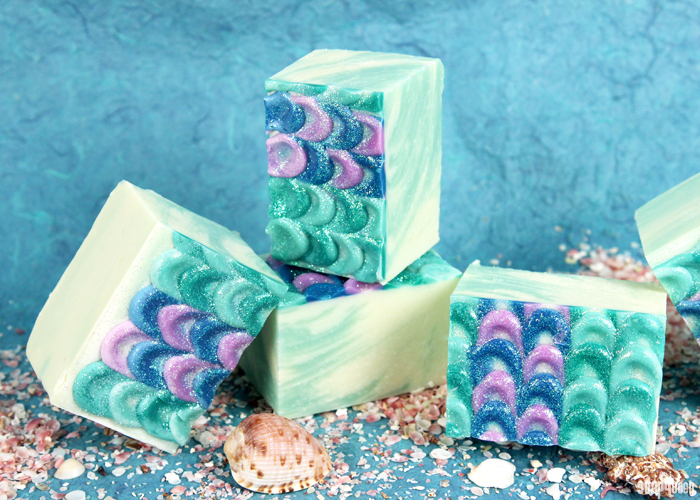 Mermaids appear in various folklore stories from a wide range of cultures, and became extremely popular by Hans Christian Andersen’s fairy tale, “The Little Mermaid.” This cold process soap was inspired by scales of a mermaid’s tail. 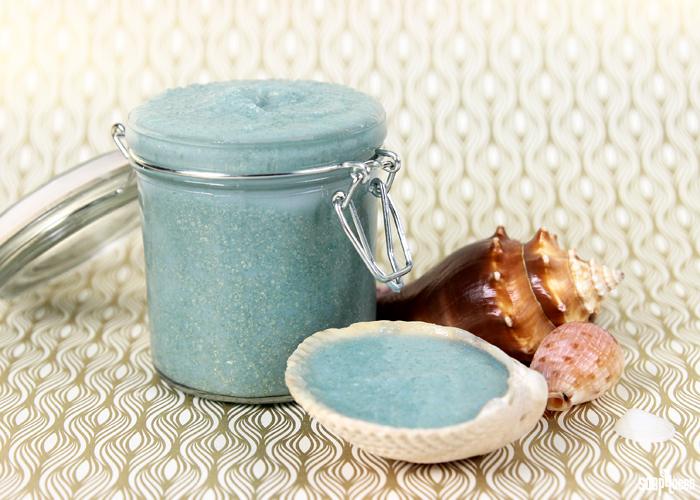 The base features a simple blue and white in-the-pot swirl to mimic waves of the ocean. 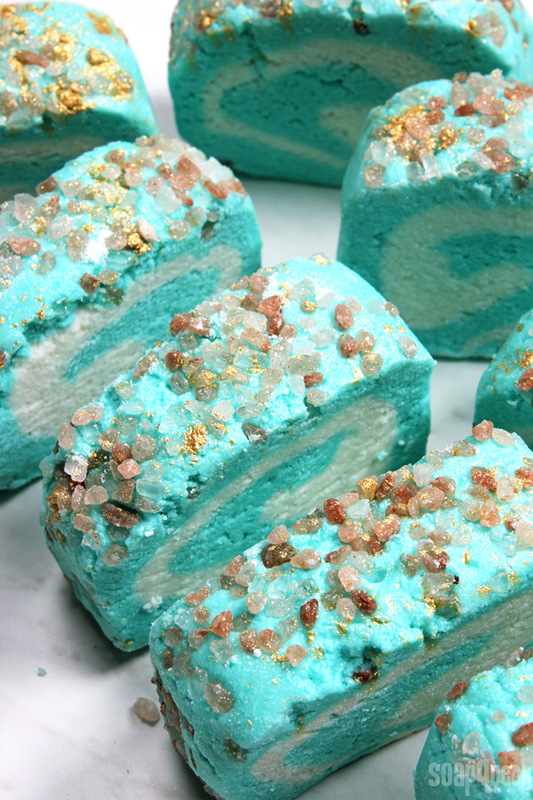 Iridescent glitter gives this soap plenty of sparkle and shine, while Crisp Cotton Fragrance Oil adds a fresh, clean scent. To create the scale effect, this project uses the petal technique introduced by Erica Pence in the Artisan Soapmaker Ezine and made popular by Kenna of Modern Soap Making. The petal technique takes a steady hand and a bit of practice. First, small dots of soap are squeezed in a row. 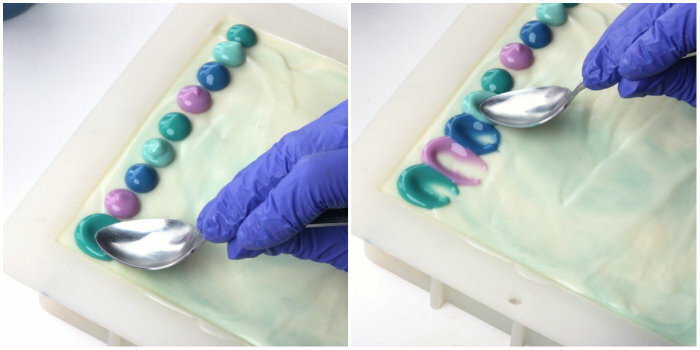 A spoon is pressed into the dot to spread the soap and create a petal/scale shape. Before attempting a large batch, you may want to practice the technique on parchment paper to get a feel for the movement. Once you get the hang of it, it’s surprisingly simple. Basic eye shadow colors, like brown and gray, are great for everyday use. But every now and then, it’s nice to switch it up and try out new colors. 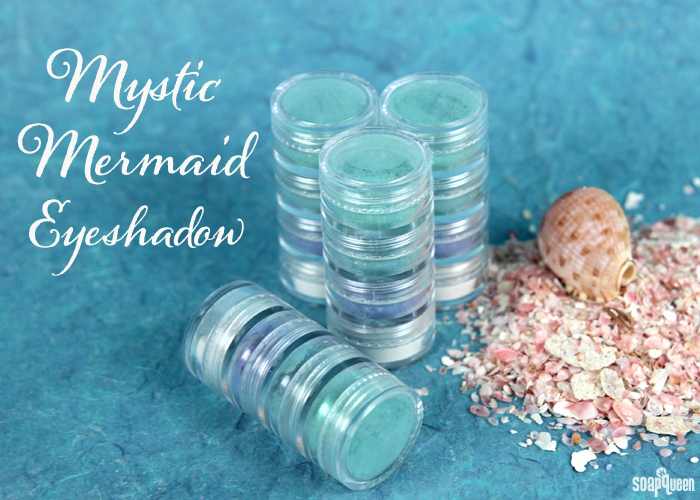 This Mystic Mermaid Eye Shadow adds bold color and a subtle shimmer to your eyelids. They’re a perfect way to add some variety to your everyday look, or to create a glam look for a night out. 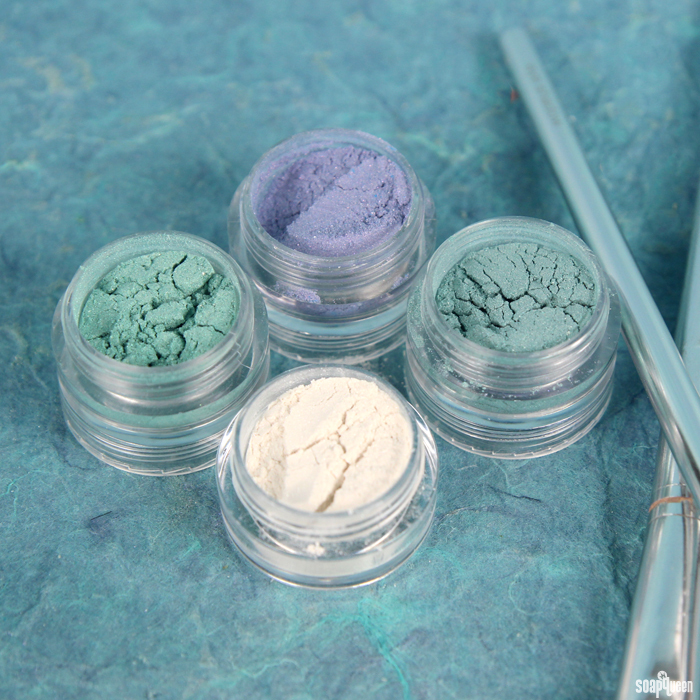 This tutorial shows you how to create four mermaid inspired eye shadow tones. 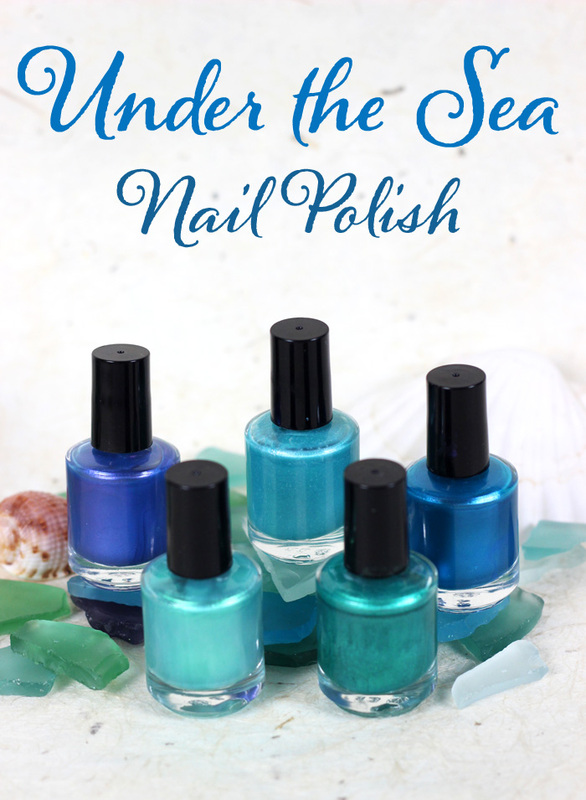 Scroll to the bottom for a demonstration on how to apply these shades! The white eye shadow has a bit of shimmer from Super Pearly White Mica, which adds interest to your base color. It also works as a highlighting shade. The purple, blue and teal colors are great for shadows and contouring. You can also switch up the colors for a unique look each time. Dipping your makeup brush in a little water intensifies the color, giving you more color options. If you have never made mineral makeup before, it’s incredibly easy! To learn more, check out this Mineral Makeup Soap Queen TV Episode. 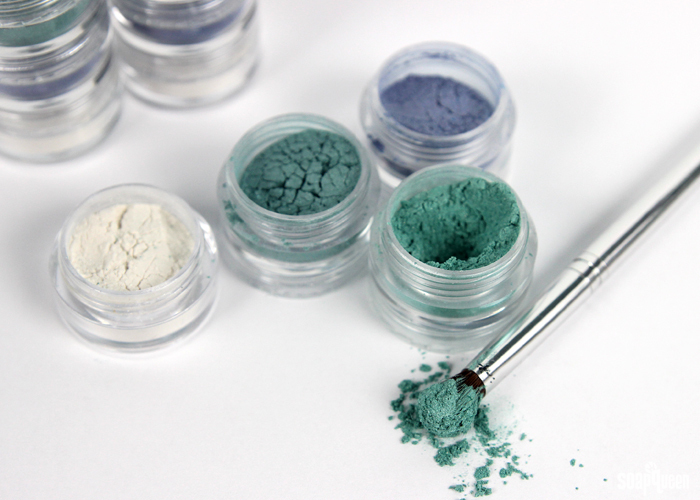 Make sure when you are creating eye shadow that you use eye safe colorants; colorants not approved for the eye area can cause extreme irritation. 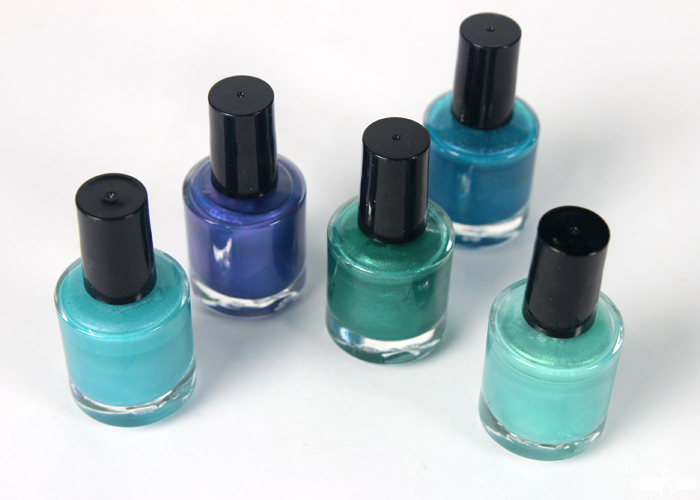 Click here for a list of eye shadow safe micas and colorants.